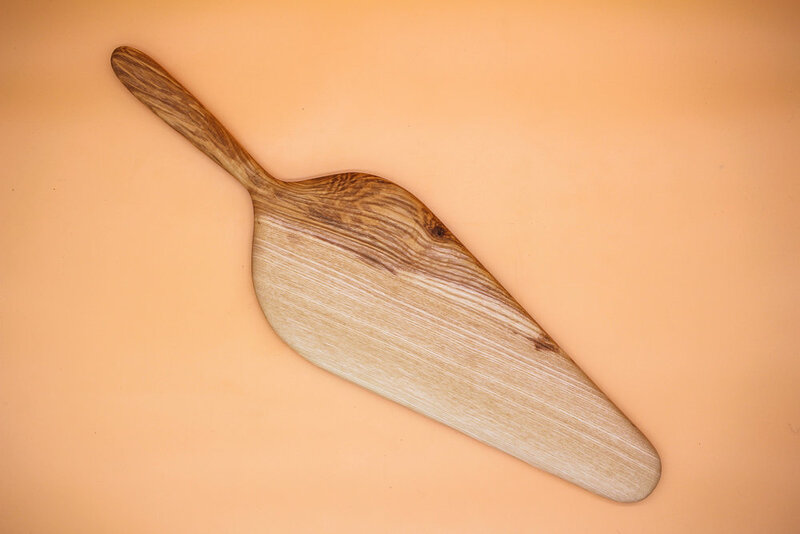 The boards are smooth and beautiful so they are best placed on top of a tea towel if they are being used to chop on. This saves them slipping around and protects the underneath surface. Oil regularly and love. All the woods we use are naturally antiseptic. Has a very tight grain and is long lasting (probably the best wearing). It is a hardwood and deals with being cut on extremely well. It is good for veg, cheese and meat. Easily cleaned and naturally antiseptic. Hard and long lasting will darken with time with a looser grain than beech and I think is better for cutting bread and as a display board. Its darker colour sets off cheeses very well. Incredibly beautiful. Best for display use, and not everyday, cutting and chopping, good cheese and finger board. An all rounder. It’s hard and dark. The surface will be more scarred by a knife than beech but it is easy to clean and it looks great when cheese or finger food is served on it. Possibly the most interesting and multi-coloured wood we use with beautiful pinks and tiger like stripes in its grain. It is an all rounder as well and makes anything look good. Its only fault if it has one, is that it is more sensitive and prone to warp. It needs to be cared for and not exposed to temperature changes or being soaked. Love this wood. It is hard and can have the most amazing difference in colour in the same piece going from dark brown to almost white. It is hard wearing and can be chopped on and scrubbed hard and still forgive you. Every piece of wood we choose retains its look until the final polish and oil. It always has a magic and delight. The notes above are a very general guide, as even within the same species of tree the grain and wood colour and hardness can vary more than you might think. If you have got a house of oog board we hope you enjoy it for many, many years.